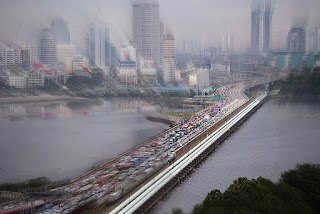 KUALA LUMPUR • The Johor government will hold a meeting with Singapore officials soon, during which the possibility of reviving the "crooked bridge" project linking the Malaysian state and Singapore will be raised, said Johor Menteri Besar Osman Sapian. He said the meeting, to be held either on Oct 27 or 28 in Singapore, will also be attended by Economic Affairs Minister Azmin Ali. "We will discuss issues including water price, bilateral development and investments. We will try to attract investors from Singapore to Malaysia," Datuk Osman told reporters yesterday. "We might also discuss the crooked bridge project with them to see if they want to join us or otherwise, and also the third (Singapore-Johor) bridge project. We will get feedback from them." He did not say what the meeting in Singapore would be about. The Johor chief minister said he had proposed the idea of reviving the crooked bridge project linking Johor to Singapore with Prime Minister Mahathir Mohamad during a meeting last month. 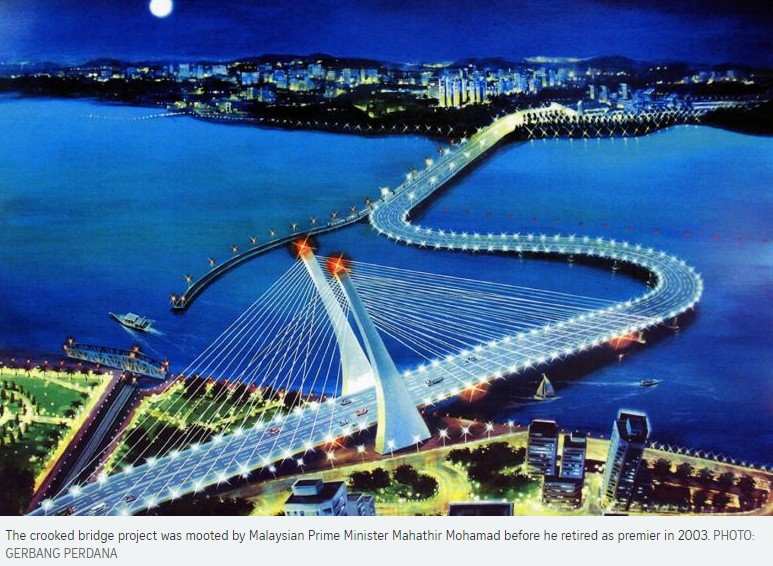 The bridge plan, to replace the Malaysian side of the Causeway in Woodlands, was mooted by Tun Dr Mahathir in 2003. It was dubbed the crooked bridge as the infrastructure would involve an S-shaped, six-lane highway that would allow vessels to pass underneath. The project was dropped by Tun Abdullah Badawi after he took over as prime minister in late 2003. Mr Osman said Dr Mahathir had asked him in a recent meeting if Johor needed the bridge, and he had said that it was up to the Prime Minister to decide. "Perhaps past prime ministers didn't feel comfortable continuing a project started by Dr Mahathir," Mr Osman said. "So he said if we want to do it, no problem, because it would not involve demolishing the Singapore parts of the bridge, only on our side," he added. Mr Osman also mentioned the possibility of a "third bridge" linking Singapore and Johor. 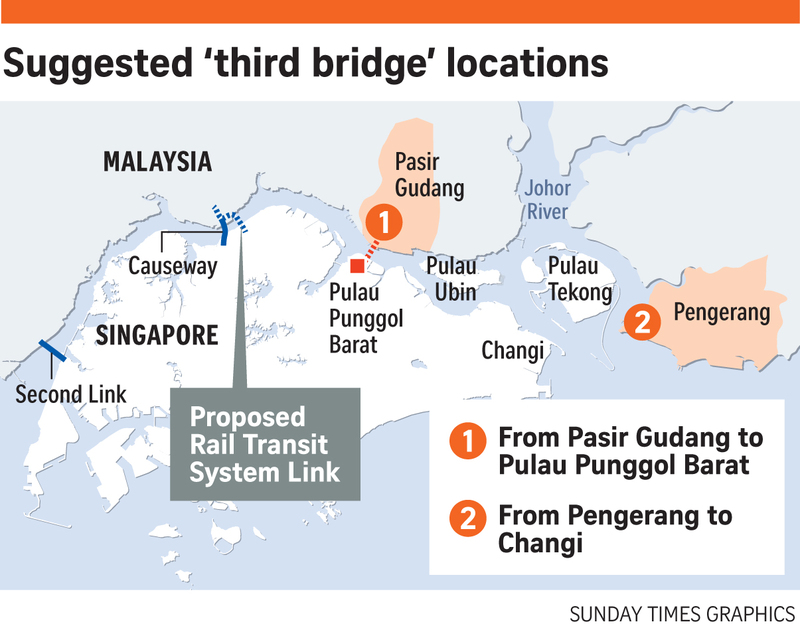 In August, Malaysia media reported that the Johor government was researching the possibility of a bridge from southern Johor's Pengerang district to Singapore's Pulau Ubin. 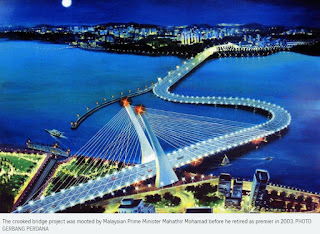 KUALA LUMPUR • Malaysia's Economic Affairs Minister Azmin Ali yesterday said he will look into a proposal to build a "crooked bridge" that was raised by the Johor government, but that the government prioritises projects that benefit the people. Responding to the idea of a bridge to replace the Malaysian side of the Causeway, Datuk Seri Azmin said he would look into the matter once the Johor state government raises it at the federal level. He said projects such as roads and hospitals have priority over those like the crooked bridge that would have to depend on Malaysia's fiscal situation, which he described as "not good at present". "Once we see the proposal, the ministry will look into the matter and see whether we have the capacity at this point in time to continue with the project," he told reporters. The idea to revive the crooked bridge was raised on Tuesday by Johor Menteri Besar Osman Sapian, who said the Johor state government will hold a meeting with Singapore officials at the end of this month, during which the possibility of reviving the controversial project will be raised. The idea to replace the Malaysian side of the Causeway was first floated in 2003 by then Prime Minister Mahathir Mohamad. It was dubbed crooked bridge as the infrastructure would involve a six-lane, S-shaped road that would allow vessels to pass underneath. The plan was dropped when Tun Abdullah Badawi took over as prime minister in late 2003. There are two land links into Johor - the Causeway in Woodlands and the Second Link bridge in Tuas. Earlier yesterday, the Johor chief of the Democratic Action Party (DAP) said the crooked bridge proposal is a good idea but not an immediate priority. Mr Liew Chin Tong said the DAP, one of the parties in Malaysia's ruling Pakatan Harapan (PH) coalition, would instead support a proposal for a third land link. "We think the crooked bridge is not an immediate priority," said Mr Liew, who is also Malaysia's Deputy Defence Minister. "For the third bridge project, we will be happy to support and maybe we can seriously consider it. The main focus should be to ensure speedy traffic flow of people and goods on both sides, which is why DAP is prepared to support the idea of a third bridge." Do Singapore and Johor need a third link? From the tranquil waterfront district of Punggol, the skyline of towering cranes and industrial buildings of Johor's Pasir Gudang looms across the water. Boats cruise along the deep Johor Strait and wild otters splash around near the jetty. Here on the north-eastern tip of Singapore, a new bridge leading to Malaysia could one day become a reality, if the idea floated by Malaysian Land Minister Xavier Jayakumar earlier this month to ease traffic jams receives the thumbs-up from the governments of both countries. It will then be the third road crossing, in addition to the Causeway in Woodlands and the Second Link bridge in Tuas. Singapore says it has not received any official proposal or communications from Malaysia on any new link, but Mr Jayakumar's proposal has sparked fresh arguments for a solution to unplug the bottlenecks at the two links. Some 400,000 people pass through them daily. Most Malaysians enter the Republic by bus, motorcycle and even on foot to get to work. One of them is Malaysian factory operator Ain Ahmad, 45, who said she must wake up at 3am to get ready or risk getting to work late and having her salary docked or having to clock overtime hours to make up for lost time. She has made the 1.05km-long trek on foot across the Causeway several times. "Sometimes I even run until I'm all out of breath and sweaty. But unfortunately, I'm not as fast as Usain Bolt, and I'll still be late for work, so I'll have to do overtime," she told The Sunday Times. "And working overtime means I have to finish work late, so I get stuck in the evening jam! Tell me, how can I wake up early the next day?" Frustrated workers share tales of their daily commute - which can take as long as six hours on Fridays and Saturdays - about near-accidents with inconsiderate motorists or hilarious toilet mishaps. "Once, I had to call in sick because I had a major stomach upset and accidentally did the 'No. 2'. It was so stressful because I was on my bike in the middle of the jam. Now I stay away from eating anything spicy for breakfast," said a Malaysian operations manager who wanted to be known only as Mr Lee. No. 2 is slang referring to moving the bowels. Most people interviewed say they are keen on the idea of a third link, believing it will reduce traffic congestion and cut travelling time for Malaysians residing in eastern Johor, like in Masai. Analysts also throw their support behind a third link, especially on the eastern side of Johor, which they believe will not only improve connectivity for commuters, but also serve large and important industrial facilities in such thriving townships as Pasir Gudang and Tanjung Langsat. Dr Francis Hutchinson, senior fellow at the ISEAS-Yusof Ishak Institute, told The Sunday Times that about 70 per cent of the traffic between Singapore and Malaysia is by road, which entails crossing one of the two existing linkages. "In addition, a substantial portion of the traffic between Singapore and Johor is by firms that want to send their goods through Changi," he said. "This would alleviate the Causeway of a lot of heavier cargo-bearing traffic, reducing crossing times between the two territories." The link between Pasir Gudang and Pulau Punggol Barat, as proposed by Mr Jayakumar, will benefit both countries, said Dr Terence Fan, transport analyst from the Singapore Management University. "It will help to increase access to Seletar airport from that part of Johor, and make it easier for staff and business-related visitors from Singapore to access the industrial areas in Pasir Gudang," he added. Tucked away in a corner of Johor's south-eastern town of Pengerang, a regional oil and gas hub is rising up and set to open next year. When completed, the US$27 billion (S$37.2 billion) Pengerang Integrated Petroleum Complex is expected to be Malaysia's biggest refining and petrochemical complex. Once-bustling fishing villages have been moved and the small jetty in Tanjung Pengelih - which used to receive hordes of Singaporeans looking to enjoy a laidback weekend of fishing and cycling - has become quiet and dull. Despite this, a 70-minute bumboat ride from Changi Point Ferry Terminal remains the fastest, most direct way to reach Pengerang from Singapore. By comparison, it takes 2.5 hours to drive there via the Causeway. Hoping to bring greater development to Pengerang, Johor Menteri Besar Osman Sapian in August suggested a bridge linking the town centre in Sungai Rengit to Singapore's Pulau Ubin, and then an undersea tunnel to the Singapore mainland. The suggestion has been met with scepticism, at least in the short term. When The Sunday Times arrived at the Changi terminal at 9am last Tuesday, there was no queue in sight. After a three-hour wait, only four people - all foreign tourists - had turned up. The boat was chartered for $130, and the cost split evenly. On reaching Tanjung Pengelih, no taxi or Grab car was waiting at the jetty, cellphone reception was poor, and construction materials lay in heaps on a freshly cleared plot nearby. A Pengerang resident, 60-year-old fruit seller Chua Jit Hian, complained that many of his neighbours have moved and his business has dropped by 90 per cent. "Maybe a bridge from Singapore will be able to attract more tourists and help to bring more business here," he said. Others, however, were less enthusiastic. Human resources manager Hasrin Shah, 50, questioned if the proposed link is worth the huge funds needed to build it. "How often will Malaysians or even I travel to Singapore? I don't wish to see the governments of both countries waste their money on what might potentially be a white elephant," he said. Mr Ahmad Nasir, 42, who works in the construction business, said a new bridge is unnecessary if plans are under way to build a cross-border rail line between Johor Baru and Singapore. Mr Ahmad was referring to the Johor Baru-Singapore Rapid Transit System (RTS) connecting Bukit Chagar station in Johor Baru to Woodlands North in Singapore. Construction of the 4km line, which is able to transport as many as 10,000 travellers in one direction per hour, is expected to begin next year and open in 2024. For Singaporeans, the bone of contention is developing a bridge through Pulau Ubin, which many regard as the last village in Singapore. The 1,020ha island is also home to the Chek Jawa Wetlands, one of the country's richest ecosystems, with mangrove swamps teeming with wildlife such as flying dragons, sting rays and mantis shrimp. National serviceman Syawal Jasmin, 19, who visits the island every week to go fishing, said: "Instead of having a peaceful time alone and being able to relive the kampung days, there will instead be plenty of people on the beach walking around, and I won't be able to relax." Prime Minister Mahathir Mohamad himself has revived his 2002 plan to build a "crooked bridge", one that would replace Malaysia's half of the Causeway and curve in a way that will allow vessels to pass under it. People The Sunday Times talked to had trouble visualising the S-shaped half-bridge, and they asked to see a sketch. "I don't understand how a longer winding road can help to reduce jams. It will also look quite ugly," Malaysian clerk Joyce Tan, 35, said. Said ISEAS' Dr Hutchinson: "It would make more financial sense to invest additional resources in multiplying means of connectivity, rather than replacing what exists already," he added. And there were ideas galore. Malaysian operations manager Sivabala Doraisamy, 56, said a ferry service from Woodlands to Johor could ease the burden of commuters. A Johor resident offered the novel idea of having travellators with motion sensors on the Causeway but easing the traffic jams may just be a matter of re-examining operations at the checkpoints on both sides. Singaporean Aszri Sarkawi, 46, who lives in Johor Baru but rides daily to work in Singapore, said he noticed unmanned counters at the immigration checkpoints. "We can build many bridges but ultimately, we have to ask ourselves if we have the capacity to employ more people manning the counters and carrying out security checks," he said. Mr Xavier Jayakumar, Malaysia's Water, Land and Natural Resources Minister has proposed a new link from Johor's Pasir Gudang industrial area to Singapore's Pulau Punggol Barat, near Seletar Airport. Mr Jayakumar said in an Oct 18 statement that there is a "dire need" for an additional link so as to relieve daily commuters of the "long and arduous hours" on the two crossings which only become worse during the festive season. Johor Menteri Besar Osman Sapian told Malaysian media in late August that the Johor government was in talks with a company to erect a bridge linking Sungai Rengit, in Johor's south-eastern district of Pengerang, to Pulau Ubin in Singapore. An undersea tunnel will take motorists from Pulau Ubin to the Singapore mainland. "We want to spread development to other parts of Johor..." Mr Osman was quoted as saying by The Star Online. He did not give details on the proposed route. Malaysia's former prime minister Najib Razak during a leaders' retreat between Malaysia and Singapore in April 2014 mentioned long term plans for a "friendship bridge" as another road link between the two countries, without specifying a location. Prime Minister Lee Hsien Loong had then said that Singapore's "pre-occupation" is to first improve the current customs and immigration checks at the border, where the queue is "very long". "For the long term, I can imagine and foresee that at some point, we will have to widen the links across the Straits of Johor. And we should study now how we can develop for the long term a new link," he said. Malaysia's Prime Minister Mahathir Mohamad had mooted the idea to build a new bridge to replace the Causeway prior to his retirement in 2003. Singapore did not agree, so he planned to erect, on the Malaysian half of the Causeway, an S-shaped half-bridge. This is widely referred to as the crooked bridge due to its shape. The project was however cancelled by his successor, Datuk Seri Abdullah Badawi, in April 2006. Tun Dr Mahathir, in the last few weeks has revived the crooked bridge idea. Malaysia's Economic Affairs Minister Azmin Ali earlier this month said a crooked bridge project at the Causeway is not a priority. A spokesman for Singapore's Ministry of Foreign Affairs, meanwhile, on Oct 18 said the Republic had not received any official proposal or communications from Malaysia related to the construction of a crooked bridge or any other new link between Singapore and Malaysia.